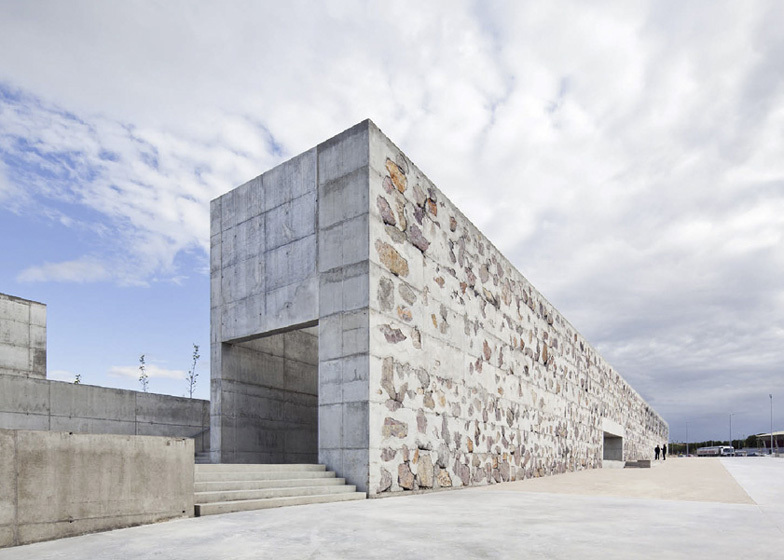 Gabion walls, concrete staircases and huge rocks frame the spaces of this public park in Zaragoza by Spanish architects Héctor Fernández Elorza and Manuel Fernández Ramírez (+ slideshow). Venecia Park spans a 415-metre stretch beside a ring road on the outskirts of the city, forming a gateway to the residential neighbourhoods to the south. 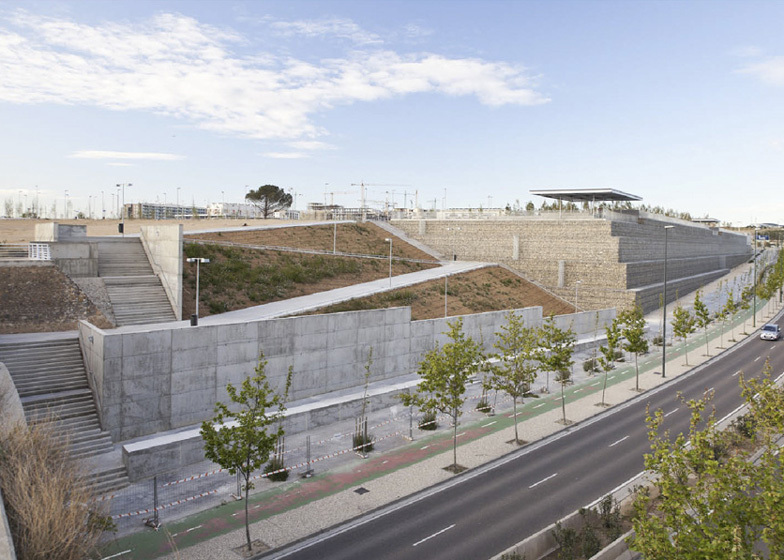 Architects Héctor Fernández Elorza and Manuel Fernández Ramírez, who previously teamed up on a park elsewhere in the city, were asked to overcome three issues - a 14-metre level change across the site, regular flooding caused by heavy rainfall and noise from the adjacent road. 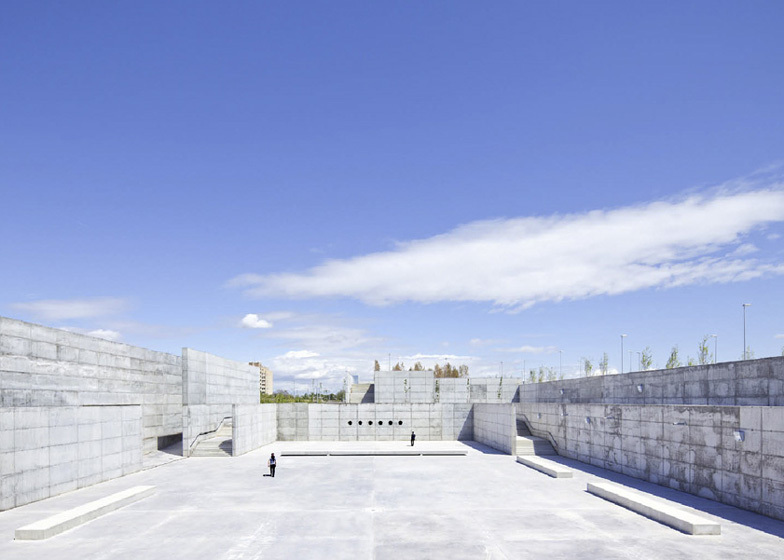 The largest space in the park is a sunken concrete plaza in the south-west corner. Staircases lead down to it from all four corners, while the surrounding walls offer protection from the strong prevailing winds. Most of the time this space can function as a pedestrian space, but it also doubles as an overflow basin for rainwater, reducing the impact of flooding to the surrounding residential areas. To create a sound barrier and deal with the level change, the architects designed a system of rammed-earth banks to run along the north-west border of the park and fronted them with four staggered gabion walls, made from steel cages and stones. 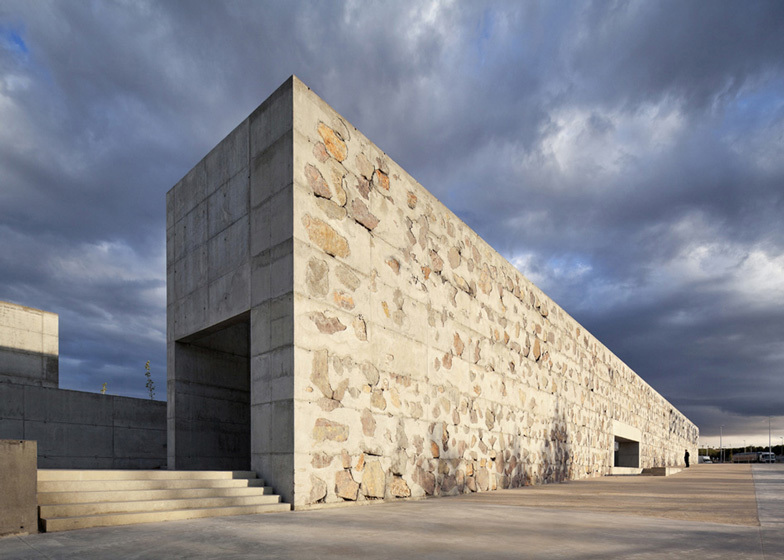 Another sound barrier was required along the south-west side so the architects specified a wall made from oversized rocks, which they refer to as the "cyclopean wall". "This wall is conceived as an icon that characterises the new neighbourhood," they said. Young trees have been planted along some of the pathways, while metal shelters mark the location of viewpoints and ramps lead on towards the nearby canal. "Venecia Park is a carefully planned topographical operation that complements the acoustic functions and flow-forming processes, in addition to providing green spaces to the city," added the architects. Other landscape architecture on Dezeen includes a public square in Croatia where steps, terraces and textured paving delineate different zones and a colourful city park in Copenhagen featuring street furniture from 60 different nations. The green space within sector 88/1, known as Venecia Park, is located at its north-western limits, running parallel to the Ronda Hispanidad Avenue between the Calle Zafiro Roundabout and the historic channel of the Imperial Canal of Aragón. The project encompasses a linear urban infrastructure, averaging 415 metres in length and 60 metres in width: a surface area of approximately 2.5 hectares. It was required to address three issues: the resolution of an acoustic problem, the evacuation of rainfall deposits and the question of topography. The sound issue caused by road traffic on the Ronda Hispanidad (Third Ring Road) affecting neighbouring dwellings, requires the establishment of a sound barrier to include the whole north-western border of the park. 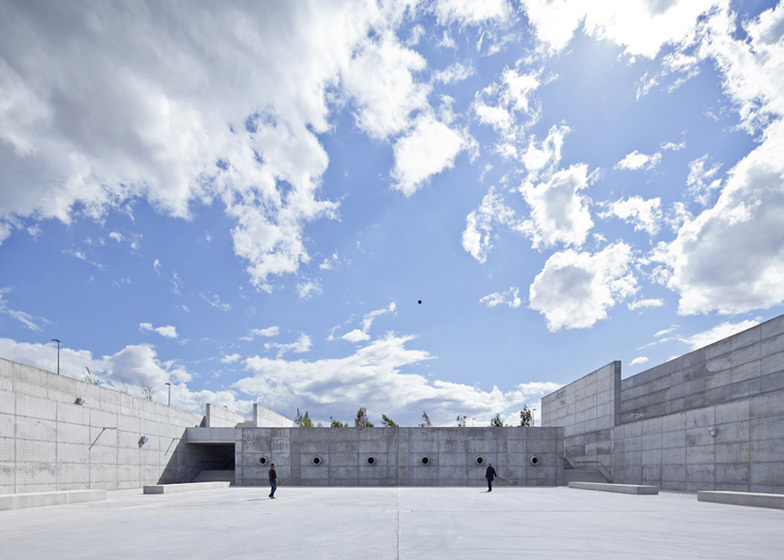 The existing topographical ground level difference between ground-level of the new residential quarter and the ring road reaches a maximum height of 14 metres, where the containment of the terrain is resolved by means of a system of reinforced earth walls. 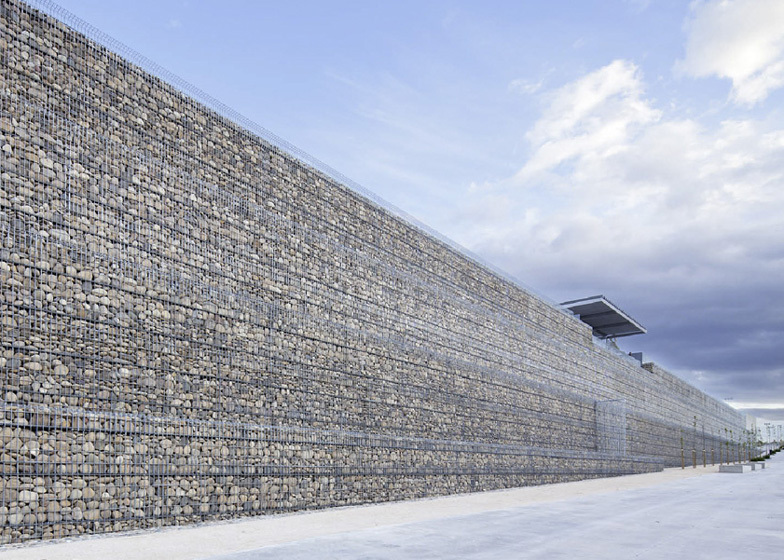 This is made up four steps set apart from one another by 1.50 metres, composed of a galvanised steel mesh and large gravel stones, thus forming a sound barrier that will protect future residential developments in the area. To the far south-west of the park, where no significant topographical difference is noticeable, the issue of sound containment is resolved by means of a Cyclopean wall 100 metres long with a maximum height of 10 metres. 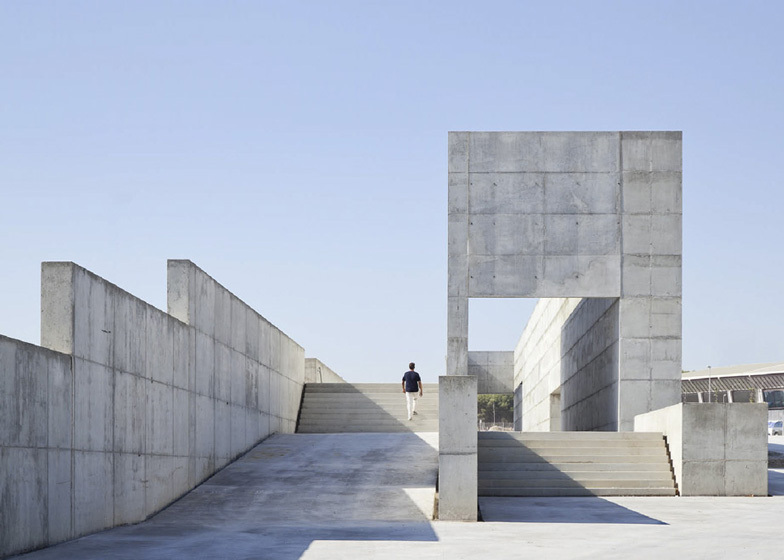 This wall is moreover conceived as an icon that characterises the new neighbourhood and also provides access to the underground square or mill basin situated in its extrados. This laminar flow basin is designed to cope with the intense rainfall that affects the area, thus preventing floodwaters from emptying into the municipal network, whose diameter and capacity are insufficient to deal with such heavy quantities of rainwater. 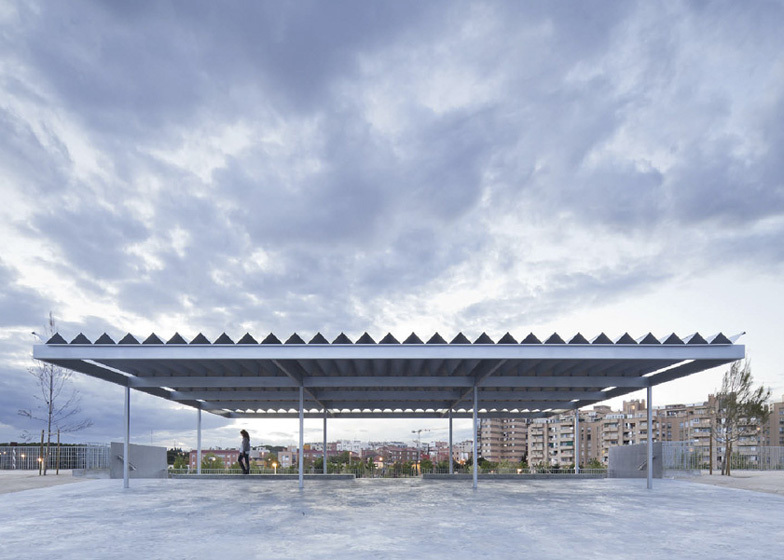 This compound with its large surface area (3,150 m2), whose use as a laminar flow space will be conditioned by the frequency and intensity of local rainfall, has been conceived and designed as an urban space or pedestrian square for most of the year and a welcome area of shelter from the unpleasant Cierzo wind which blows in this upper area of the city. Four stairs situated at the corners provide access to the underground square, connecting with the adjacent neighbourhood and the city level. The incorporation of sufficiently wide ramps situated within the sound barrier wall gives access to service and maintenance vehicles and a more ample use of the compound. Finally Venecia Park is a carefully planned topographical operation that complements the acoustic functions and flow-forming processes described above in addition to providing green spaces to the city. All this is structured spatially over the Ronda Hispanidad by means of staggered interconnecting platforms in a linear or extended link-up of little squares (hard and soft), viewing points protected with light metallic pergolas, extensive groves of pines and pedestrian ramps leading to the historic heritage site of Aragón's Imperial Canal.